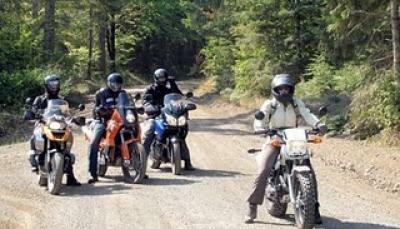 This weekend will be the first AltRider group ride. Being selfish and thinking just of me, I am not so sure how it will go down. I am no doubt, a newbie in every sense. I do officially have my motorcycle endorsement, but that doesn’t mean I have been as diligent about riding since June as I had wanted to be. In fact, I still have been on the freeway only twice. And I haven’t ridden poor Blanca in probably a month. So come Sunday I will be with a group of men who ride nearly every day, and a girl who did a 23,000 mile motorcycle trip to South America. At least they are no dirt experts, except of course for Jeremy, who never misses an opportunity to do a wheelie in the dirtiest of tracks. So I am hoping my riding companions will be considerate, and not leave me in the dust, or rather dirt. I have high hopes that they will feel compassionate when I drop the bike for the 82nd time that day and yell some bad words, most likely at the trees and the machine and maybe even them. Okay, possibly they’ll just laugh, and then I’ll be able to laugh through my embarrassment and frustration… Good times to come! Stay tuned for the ride report and pictures next week.